Throughout December you can make the easy drive south (yes!) 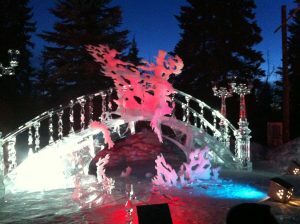 to North Pole, Alaska (101 Saint Nicholas Drive to be exact) and view the ice sculpture, ride down the long ice slide, and get a taste of true northern art form: small and large ice blocks carved into beautiful creations. The park is open daily, 11 am to 10 pm.